We are getting close to wrapping up our series on NUDGES today – and if you have been following along each week you know we went a little out of order and did the E in nudges last week – expecting error, and are now coming back to G for giving feedback. This combines with incentives, understanding mapping and defaults (which we have covered already starting off the series in episode with an introduction to nudges in episode 35. Next week will wrap it all up with structuring complex choices…and then we will move on to our next topic (and it is one I am really excited about – you are going to love episode 42 to be sure). [03:19] Last week I talked about errors people make on things like getting their oil changed or replacing the filter on the refrigerator. The light that comes on to alert you it is time to take care of this task, is essentially the feedback mechanism or the little nudge. [03:51] Choose your feedback wisely, when there is too much people start to ignore the alerts. [04:48] This is where understanding mapping is really important. When you understand the best outcome for the chooser you can properly structure the choice architecture. [06:24] There are a combination of concepts at play along with the nudges and choice architecture, including optimism bias, and time discounting. [09:33] A speed sign with flashing lights is feedback from an expected error. Something that has been created based on the way the brain actually makes decisions to help make the roads a little safer. [11:27] Remember, vision takes place in the brain. Our brains take in all those pieces of data and put them together with alerts and tasks based on rules of thumb. [13:03] The HVAC company could have a system that would notify customers when it’s time to schedule their maintenance. And, because it has smart technology, it could be created to do the work for them. 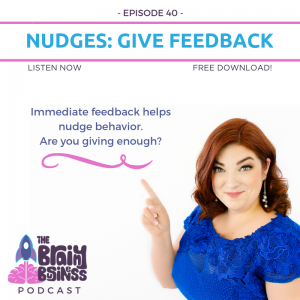 [15:57] The nudge the company could put in place (which is using a combination of feedback and loss aversion) is to strategically create their sales process to encourage the person to make their decision that day. [17:34] Like the wedding dress store, the HVAC company could give discounts if the customer purchases on the same day of the sales call. [19:48] Simple things can make a big difference. Examples are our phone cameras clicking, and website links changing color. [22:29] I think it is important to note here that a lack of a negative does not necessarily lead to a positive feeling. [24:07] Feedback allows people to know they are doing a good job – or where they are going astray. [26:12] Wouldn’t it have been nice if you had a little feedback during the process? This is exactly why the geniuses at Glidden created a ceiling paint that goes on pink and dries white. [28:22] Color coding is really helpful for our visual brains. The episode on color theory is coming soon – I promise, but know that our subconscious picks up on the colors and knows what it should be striving for (green is good, red is bad). An example on helping people use less energy. [28:46] How can your business incorporate the senses – color, pressure, scent, or sound to provide feedback to your customers to nudge them into better behavior? [29:16] Feedback can also be useful when things take a while and there are a lot of steps happening behind the scenes. Domino’s Pizza Tracker gives helpful feedback. [31:01] Feedback is appreciated and can help your customers to quell an anxiety they may not be able to articulate beforehand. [31:45] Timers without a tracker make people wonder if they did something wrong. [32:12] If someone is stressing about all that stuff, they are not paying attention or retaining anything from your advertisement, so you should provide that little bit of feedback. [33:19] Using feedback with credit cards. Is there a way to provide feedback and a nudge for those who would have issues without inconveniencing those who do not need the nudge? [34:43] The point of feedback is to get as close to the action as possible. [37:24] Using money in a jar as feedback of progress and an incentive to keep moving forward. Also using loss aversion by losing that money if you miss a day. [37:33] You can use this trick for any goal. How could you use a tactic like this with your employees or customers? [38:29] Take a look at your company, customers, and the products or services you offer for opportunities to provide feedback. THE ENERGY ORB: Visualize Electricity Consumption!